This post explains how to do a very affordable and simplistic Fasting Mimicking Diet that can offer similar benefits as the commercially available ProLon Fasting Mimicking Diet by Dr. Valter Longo. The benefits of rebooting your body with a Fasting Mimicking Diet extend to improving your immune system and your overall wellness. This is because fasting can be healing, and FMD is a diet that tricks your body into thinking that it’s fasting, when it’s really being nourished by super amazing nutrients. This diet is different from the concept of intermittent fasting, which was covered in the post titled Ketogenic Diet And Fasting 101 (For Weight Loss, Brain, Skin, Wellness). 2 Who Should Avoid The Fasting Mimicking Diet? 5 Twitching, Feeling Lazy, Or Having A Bit Of A Headache? Get Some Electrolytes! 7 How Does The Keto Flu Feel Like, And How To Cope? Fasting has been known to have healing qualities, including rejuvenating cells, prolonging life, and reversing some adverse health conditions. All the foods mentioned in this post are plant based. This means that they are good enough for vegans, vegetarians, and whole foods lovers, as well as paleo, Atkins, and keto followers. You really don’t need to be following any specific diet to reap the absolute fantastic benefits of this healing regimen. This version of the diet will use avocados as one of the main nutrients. If you don’t like avocados, many nutritionists suggest other foods, such as macadamia nuts. 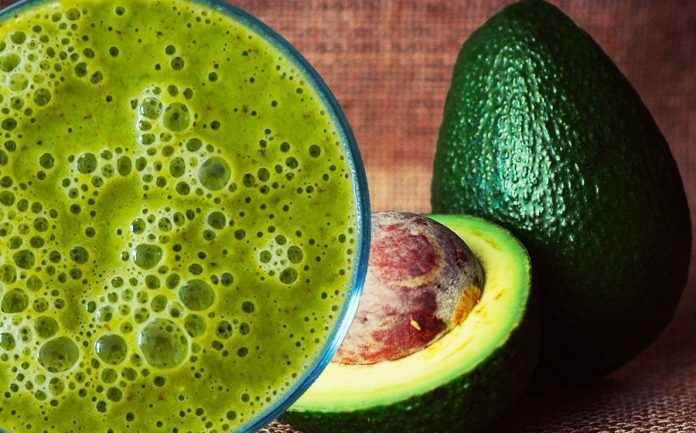 For the sake of simplicity, this post will concentrate on three ingredients: Avocados or macadamia nuts, a superfood drink, and electrolytes. Who Should Avoid The Fasting Mimicking Diet? Young people, under the age of 18. People who are chronically ill and/or on medication (consult with your doctor first). Menstruating women (women on their period). Any restrictive diet may lack iron and vitamin B12, which are both crucial to the production of red blood cells. A lot of blood is lost during this time, and women should really try to rest and balance their hormones as much as possible with nutritional foods such as poultry, eggs, fish, some cheeses, and dark leafy greens. Here’s some general information about the FMD. It is restrictive in calories (about 800 calories per day) and can last up to 5 days per month. If you prefer, it can be cycled every other month. Make sure to break the fast with other foods after 5 days so that you can trick and confuse your body to perform with maximum efficiency. You also want to avoid becoming anemic. Do not binge eat on inappropriate foods after you finish your cycle of FMD. You must be sensitive to your body because this diet is a healing diet, and not a starvation diet with promises of great weight loss. The goal is to reboot your metabolism with the Fasting Mimicking Diet, and not to damage it. This fast mimicking diet will ward off illnesses and keep you healthy. It will get you into a comfortable state of ketosis faster than anything else (including drinking water alone). After this diet, you may want to incorporate a low carb diet (i.e. Ketogenic diet), or a healthy regimen. If you follow a paleo or a keto diet, at day 5 of the FMD, you will already be in ketosis. 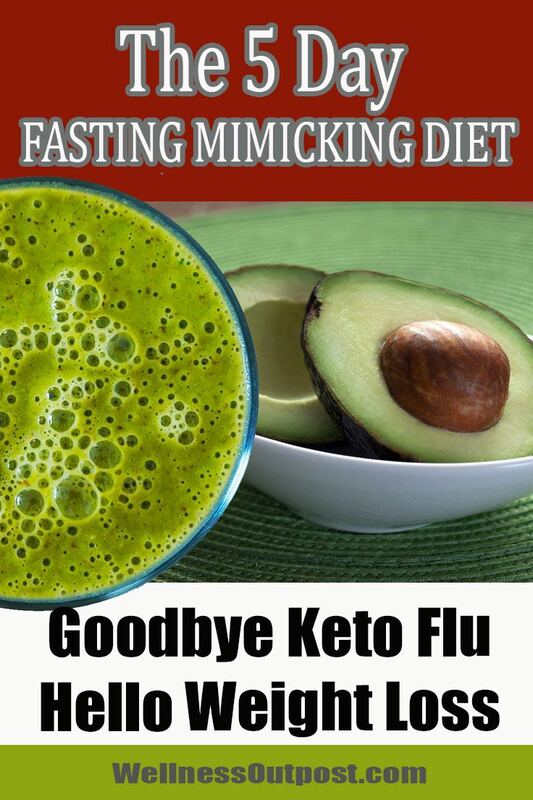 You will have negligible to no keto flu symptoms (no headaches, no cramps, and no laziness). This is mostly true if you have not abused your body with too much sugar in the past. Many people may recommend other ways of how to do the Fasting Mimicking Diet, but in this post, we will simplify it as much as possible. There are a few ingredients that you will need on this diet. For 5 days, they can help not only your health and your waist, but they can also help support your wallet. You will need 10 avocados to last you 5 days. You will eat 1 avocado for lunch and 1 avocado for dinner. You can get them at your grocery store, or you can buy them online. Avocados can be kept in the fridge to keep them from maturing too quickly and to keep their freshness. The health benefits of avocados are amazing, and even if you don’t do the FMD, you should incorporate one avocado per day in your daily routine. Avocados are anti-inflammatory foods that are great for digestion, heart health, arthritis, and autoimmune diseases. If you’re using macadamia nuts, you want to have enough to support you for 5 days (a 24 oz. bag of macadamia nuts is enough = 48 tbs.) You will be crushing the macadamia nuts to measure them. You will be eating 4 tablespoons of macadamia nuts twice a day (so, buy a total of 40 tablespoons of macadamia nuts to support you for 5 days). You will be drinking 2 cups of green drink powder superfood each day. Just ask for it at your health food store, or search for it online. The one shown here tastes good and is what we recommend, but feel free to explore other products. You want to make sure that your superfood powder drink has enough antioxidants, phytonutrients, and tastes good. Otherwise, your drink will taste like grass (literally). If you already have a green superfood drink that tastes bad, add a bit of stevia to the mix, and that should help. You will simply follow the instructions on the package, add the powder to water, stir it up and drink it. Powder drinks have fewer carbohydrates than real vegetables and fruits. Green drink powder is more affordable than purchasing vegetable and fruit produce to juice each day. They are available all year round. Electrolyte is a scientific term to indicate the important salts that your body needs to survive. You can get them from liquid products, or include about a teaspoon of Celtic Sea salt to a gallon of water to sip on every day (you can also add a bit of salt to your green drink). Electrolytes are very important because they conduct the electricity in our bodies, especially in our cells and organs. Without the proper amounts of electrolytes in our bodies, we can die. Sodium – Critical to the body function. It regulates the total amount of water by transmitting sodium in and out of cells. Potassium – Critical to the function of cells in the body. It also regulates the heartbeat and the muscle functions. Chloride – This super important electrolyte is usually lost in the urine and during sweat. It helps the body keep a normal level of fluids. Too much of this electrolyte can bring on diarrhea, or kidney issues. Too little of this electrolyte can disrupt your body. Bicarbonate – This impacts the levels of acidity (pH) in the blood and in other areas of the body. Not having enough bicarbonate in your body can disrupt your kidney functions, respiratory functions, or metabolic conditions. Twitching, Feeling Lazy, Or Having A Bit Of A Headache? Get Some Electrolytes! If you feel any of the twitching, headaches, or flu-like symptoms, don’t worry. This means that the diet is working. However, you may not be taking in all your necessary electrolytes when you undergo a diet like the FMD. When you add electrolytes to your water or to your green drink, you want to make sure that the electrolytes have no added sugar, additives, or calories. Liquid electrolytes might work great for people who are sensitive to sodium. The best electrolytes are not going to taste like orange juice or anything like that, because they are mineral based. If you start twitching, feeling ill and tired, or start getting a headache, then you are most likely in need of electrolytes. Add about 1/4 teaspoon of Celtic sea salt to 32 oz. of water and drink it (or might as well add 1 full teaspoon of Celtic sea salt to a gallon of water and sip on it all day). Celtic sea salt has potassium, magnesium and other important trace minerals that your body is probably screaming for. Drink more of this concoction throughout the day (and repeat every day). Your symptoms will subside. Just like the oil in a car needs frequent changing to preserve the car’s engine, the ionic exchange that electrolytes provide is needed in the body to preserve its health and vitality. On the safe side, you may need to add about 1 teaspoons of Celtic sea salt for every gallon of water you consume (i.e. 128 ounces). This is to hydrate your body during the day. You may need more electrolytes during the day, especially if you feel nauseated, or tired. If you’re concerned about overloading your body with sodium, then consider adding liquid electrolytes. Make sure to get electrolytes without added sugar. It is crucial to have electrolytes on this diet. A lot of your minerals will be depleted from your body and you absolutely positively need that potassium and sodium ion exchange. These minerals will help you eliminate your flu-like symptoms, diminish cramping, provide you with energy, and eliminate headaches. How Does The Keto Flu Feel Like, And How To Cope? If you’re already in ketosis but wanted to reboot your immune system, then you would probably feel good on day 1. However, if you have been eating a lot of sugary foods and carbs prior to doing this diet, then get ready to be uncomfortable for a day or two (and sometimes more, depending on how bad your diet was before). Your day may start OK, but then you might feel a bit of a headache as your glycogen gets depleted from your liver. You want to make sure to add a lot of water and a lot of electrolytes during the day. You might also feel nauseated, and tired towards the end of the day. If you start feeling bad, don’t wait until things get worse. Add salt/electrolytes to some water and drink it. You can also add 1 tablespoon of bouillon to 1 cup of boiling water (like a soup) and drink it. If you vomit (and it could happen), it means that you need electrolytes desperately, as your electrolytes are out of balance. Severe vomiting can cause dehydration and can lower your electrolytes to the point of causing potassium to decrease sharply in your system and resulting in other symptoms, such as twitching, cramping, or muscle aches. Since your diet was really bad prior to FMD, the nauseous feeling may come back the next day towards the end of the day, or may even linger for a few days… To avoid it, keep hydrating during the day and adding those electrolytes or salts. You might think “what the heck did I get myself into?” but if you’re healthy to begin with, stick with it. Salt and electrolytes are so important because they’re going to minimize the feeling of withdrawal. If you don’t add enough salt that provides you with electrolytes, then you will feel like you’re undergoing a mini hangover. The symptoms will eventually pass and you will feel absolutely fantastic. Go to bed early when you feel tired because the effects may feel like a sinus infection. You want to make sure to continue to hydrate and taken in the salt/electrolytes to avoid the keto flu. The idea is to not go back to your old ways after doing FMD. You want to make sure you make healthier choices and lower your intake of processed foods, sugars, and carbohydrates. Once you repeat the diet in a month or two, you will not undergo much of the symptoms mentioned here. The Fasting Mimicking Diet (FMD) recipes should be simple and super easy to make. In fact, they are so easy; they can be prepared in less than 1 minute each. Here is a simple Fasting Mimicking Diet meal plan that you can do 5 days per month, every month. Just be ready to feel a bit of hunger the first few hours of your first day, but if you can pull through it, then you will thank yourself later. This variation on the Fasting Mimicking Diet has 2 meals. You can treat the first one as a mid-day brunch and the second one as dinner. Do not eat more than twice throughout the day. Drink water with electrolytes in between. You can wait until you are hungry again to eat your second meal. You will feel a bit of hunger your first few hours of the five day Fasting Mimicking Diet, but the hunger usually subsides once you get into ketosis (which should not take long on this regimen – Possibly overnight). For your first meal: 1 avocado or 4 tablespoons of macadamia nuts (not both). 1 serving of green powder superfood (1 scoop of leveled green powder in 6 to in 8 FL oz. of water, or follow the instructions on the back of your product). Water with electrolytes or with Celtic sea salt. In essence, you will need to drink a minimum of half your current weight in water. 1 avocado or 4 tablespoons of macadamia nuts (not both). 1 cup of green powder superfood (1 scoop of leveled green powder in 6 to in 8 FL oz. of water, or follow the instructions on the back of your product). Water with electrolytes throughout the day. The five day Fasting Mimicking Diet is just that: A diet that can trick the body into thinking that it’s fasting, but it’s just mimicking a fast. This diet is plant-based. It can be done once a month, or once every other month. It lasts 5 days each time. Once you complete the diet, you should get back to your normal way of healthy eating. If you suffer from a chronic illness or are taking medication, you should not follow this diet without the supervision of your doctor. Also, this diet should not be followed by children, teens, or women who are menstruating, pregnant, or nursing. The preliminary results of following the FMD diet have shown it to be effective in reducing weight, rebooting the immune system, helping the heart stay healthy, lowering blood pressure, improving diabetic conditions, reducing inflammation in the body, improving memory and cognitive health, as well as lowering cholesterol. 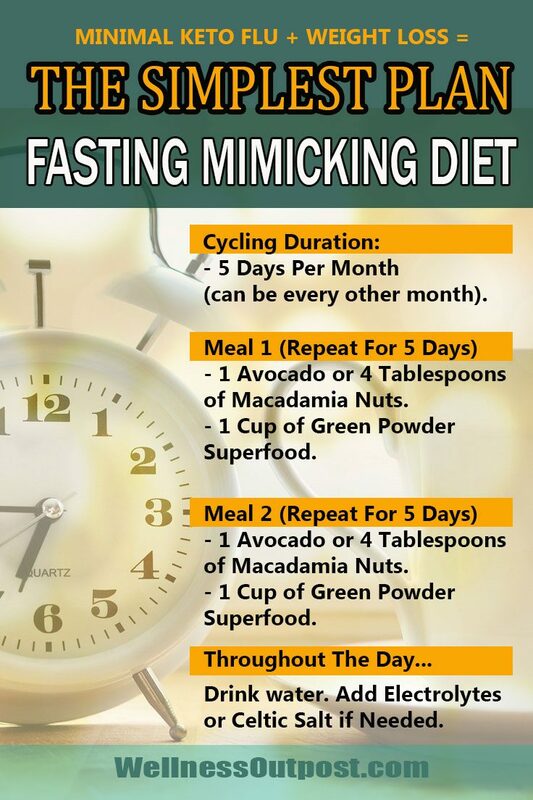 Now, it’s your turn… Do you now have a clear understanding on how to do the Fasting Mimicking Diet? Have you had any good results with the FMD before? Share your experience in the comments below and let us know. “In essence, you will need to drink a minimum of half your current weight in water”? Technically, yes. However, you can get away with taking in anything between 25% to 50% of your body weight in ounces of water every day. So, if your current weight is 200 pounds, you want to take in anything between 50 ounces to 100 ounces of water per day. Hydration can help minimize some of the side effects of FMD (i.e. headaches). More importantly, hydration is very necessary to keep your cells functioning properly. Does this version of the FMD take into account the special ratio of fat to carb to protein that Dr longo the inventor of this diet has proven works the best? Hi James. No, it’s not the same ratio, but the results may be similar. Dr. Longo’s ProLon diet concentrates on these exact ratios: Day 1: 10% protein, 56% fat, 34% carbs, and days 2 to 5: 9% protein, 44% fat, 47% carbs. So, you would have to purchase the exact meals from the ProLon diet to get those ratios. To achieve the benefits of any diet that mimics fasting you want to make sure that your “fat” content is much higher than the “protein+carb” content (at least 2:1 to 3:1 ratio… the more the better.) As you can tell from this version, which is popular among many people, it gives you a 3:1 to 4:1 “fat” to “protein+carb” ratio. You don’t have to eat avocados. Just find foods that will give you similar ratios (i.e. macadamia nuts, butter, coconut oil, etc.) and always consult with your doctor if you have a question. Hope this helps. The “fat” to “protein+carb” ratio is it measured in calories or grams? Also, the fact that you don’t change the quantities for days 1 and days 2-5 ( like in prolon where they do 1000g and 750g) is it just for simplicity? Hi. This is a very simplified approach to a 5 day fast and we measure things in terms of grams. Also, hydrating and 2 meals per day are enough if you are OK with it. Otherwise, make sure you eat all your food within a short window of time, allowing for the fasting benefits to kick in (minimum of 16 fasting hours if possible). I encourage you to measure your macros with an app (I use a paid one called cronometer) and add some electrolytes and some vitamins (including a multi vitamin and Omega-3). The electrolytes will ensure that you have enough potassium and magnesium. Otherwise, get those in other forms. Do you know where the ProLon ratios are coming from? Is the 10-56-34 coming from his patent or his prolon book? Hi. I’m not sure where the ProLon ratios are coming from. Maybe check on the website and see if they are listed there. I believe that the ratios are measured based on the packaged foods that they offer. I would contact them directly for additional info. I am going to try it tomorrow with the avocados. One of my favourite foods so it won’t be a hardship! That’s good to know James. Let us know how it goes. As long as you don’t have hypertension, you can load up on salt (or electrolytes) to fight the dreaded keto flu symptoms. Whether I’m switching back from vacation mode (some carb eating) to keto, or doing the avocado FMD I usually get generous with salt and load up on 2 nice size cups of bone broth or bouillon each day for 3 days (and more if I need it). If you have no issues with hypertension then this will help a lot. We need that sodium and potassium ion exchange (found in salt or electrolytes) to help the balance of our cells and to alleviate any keto flu symptoms, since our body will be depleted of them as we lose a lot of water in the process. Plus… If you feel bad, it gets much (much) better the second time you do this. Best of luck. so you drink bone broth while FMD ? In short, I do, but not always. When I don’t have bone broth handy, I do bouillon or salt in water. The idea is to replenish as much electrolytes as possible, since the body will lose a lot of it. Sodium, potassium, and magnesium are found in salts and bone broth and they are all important in regulating nerve and muscle functions. Is the bone broth in place of the water with salt added? It is a much better nutrient for sure. Good bone broth can also be expensive to some people, but if you can afford a good quality bone broth, definitely use it. A cup of good bone broth may have anything between 35 to 50 calories. When I have it, I drink 1 cup with each avocado meal (2 cups per day). When I don’t have it, I stick with the Celtic sea salt. So you do in fact take on bone broth during the 5 day FMD? I’m wondering how you get to the calories otherwise. The total calories are going to be a bit under 1000 per day, and will mostly come from eating the avocados or the macadamia nuts on this simple version of the diet. One avocado has about 350 calories each, and you are eating 2. You can certainly include 2 cups of bone broth per day (or electrolytes with water, or even salt with water). If you go with bone broth, you will get electrolytes, as well as other nutrients and collagen, which reduces inflammation in the intestins and heals the gut lining, but the choice is yours. Depending on the bone broth, it can be anything from 40 calories and up per cup. Hi! Just to clarify – when you say one cup of greens powder at each meal, do you mean one scoop of powder in a cup of water, or an actual cup of powder in the appropriate water ratio? Thanks! Hi Erica. It would be 1 leveled scoop of green powder into 6 or 8 ounces of water. If you’re choosing other products, just look for instructions on the back of your product. It will list the ratio. Some say 1 scoop in 6 to 8 oz., others say 1 scoop in 8 oz. etc. It all works, as long as you dilute the powder in enough water. When you said people to avoid this diet include menstruating women, do you mean at the time of menstruation or those who menstruate in general? Hi Gloria. A diet that mimics fasting with a severe caloric deficit is not recommended for women on their periods because it can lack some iron and vitamin B12 (among other vitamins). Iron and B12 are essential in the healthy production of red blood cells. During these few days, a lot of blood is lost and the woman may feel fatigued with low energy. Also, this is when a woman’s hormones are totally on edge. So, it is best to eat well in order to feel as good as possible and to support those hormones. During her period, a woman should eat nutritious foods such as dark leafy greens, eggs, meats, fish, and poultry. A bit of cheese is OK (I love cheese) but only if there are no cramps. Dairy is high in arachidonic acid and this may trigger more cramps during a woman’s period. So it’s not recommended for nursing mothers? Correct. The Fasting Mimicking Diet (or any type of severe fasting) is not recommended for nursing women because it is very limited in calories. Nursing women need to eat a wide variety of nutrients and consume a good amount of calories to support the metabolic adaptation needed to produce milk for the baby. Fasting may affect that in a negative way. I did the 5 Day ProLon. Would like to do this now. Should you start your first meal at lunch? Do I need any supplements ? Omega or multi vitamin. Or am I getting that from green juice and avocado ? Hi Jennafer. I usually start eating food 16 hours after I stop eating my last meal. I also have coffee in the morning with a bit of Stevia (my go to sweetener). So, for you, that really depends on when you ate your last meal the night before. As far as vitamins, you will be getting a lot of them in the green drinks and the avocados (which have good fats). Feel free to track things and if you feel you’re lacking some nutrients and want to include some more, just add them with foods and not when you’re fasting. I have hypertension. Does this mean I should not go on this plan? Or is there an alternative way to get electrolytes other then the salt? Hi Ann. I would recommend that you check with your doctor first if you have hypertension. This regimen is not suitable for everyone and may not be suitable for you without your doctor’s supervision. Is the macros of eating 2 avocados and a green drink similar to the Prolon kit recommendations? I know avocados are high fat. Also has anyone had a past heart attack and is or has done a FMD? I would think it was okay with the kit but was wondering with the avocados and green drinks. Hi. The macros here are not 100% the same, but similar. Also, the idea of fasting is the same, and in this post it is simplified and can cost a lot less. I agree about the fat in avocados.. It is of high content, but for healthy individuals who don’t consume a lot of carbs, and a medium content of protein (i.e. those on a Ketogenic diet) it’s one of the the best fats to consume. Now, to answer your question directly, both this and the ProLon macros and ideas are intended for healthy individuals who want to maximize their well being, maybe lose some weight, and optimize their health. I would recommend that people with chronic illnesses or pre-existing health issues run any new regimen by their doctor first. This way, they are supervised and can follow up on their numbers to see if things get better. I am about to start with the 2 avocados a day and 2 green drinks.Am I able add a tablespoon of olive oil or coconut oil or mct to my avocados with a tablespoon of nutritional yeast flakes and be the right ratio? Hi Jamie. I know that you’re trying to get some more of the good fats and many of the vitamin B’s in nutritional yeast; you can certainly experiment, but the idea is to limit calories and to treat this as a fast, and adding 2 more tablespoons of oil and 1 tbs pf nutritional yeast might give you an added 300 calories per day. It might be just fine, and it’s really up to you. Please tell me what to substitute for green powder drink as i dont get anything of this sort in my country? can i do normal jucing? If so, then which vegetables to use ? Also can i add one Bpc to each day ? Hi, I’m not sure what works best since you don’t have the green powder drink in your country, but perhaps a combination of many green fresh vegetables might work. The reason I don’t know for sure is that the green drink has a mixed number of nutrients that are available in various types of plants. So, I’m not sure if you simply juice your own, but kale, parsley, and other types of green vegetables come to mind as long as you don’t have any health issues. I am taking a product called Juice Plus+ . 2 vegetable and 2 fruit capsules per day. It is fruit and vegetable juice powder and pulp. The 4 capsules total ten calories, 2 g carbohydrates, and less than two grams of protein. The benefits are vitamins A, C, E, and folate. Would I have to stop taking this product while on the FMD? I really don’t know if they will have an effect on the fasting process. I sometimes change things around myself. If you’re healthy and decide to take the additional product then let us know how it goes, just make sure that you don’t take in too many calories. Can we drink non-sweetened and nom-dairy coffee and tea? Yes, these drinks should be fine. I love my coffee in the morning, and I may also have a green tea or two during the day until I’m ready to eat my first meal (usually about 16 hours of fasting). I add stevia to my beverages. It’s a sugar substitute extracted from plant leaves and can easily be found at grocery stores. They look like this in packet form or in powder form (which is what I really use). Throughout the years I have gotten accustomed to its taste and I truly appreciate it. Unlike sugar, stevia does not negatively affect blood sugar or insulin levels. It helped me reduce my sweet tooth cravings over time. Hi. Thanks for the great info! I plan to do this every other month. What are the guidelines to resume eating after FMD? Hi Lucy, the guidelines are simple. You can do this once every month, or once every 2 months. Whatever works best for you. I’ve done Prolon twice and really did well during and after but I can’t stand the food. I’m going to try this tomorrow and was wondering if I can alter the plan to have one Avocado a day and 8 tables spoons of Macadamia nuts? I would keep everything else the same with green powder and celtic salt. Hi Eric. I don’t see why you can’t alter the plan to suit your needs. You can certainly vary things if you see fit, but the idea is to not eat for a period of time, and when you eat to add some good fats in the mix. PLEASE READ THE BOOK! I am sure this is well-intentioned but there is so much in this post that is in direct contradiction to what Dr. Longo proposes in his book. He actually says to not do the fast unless you can do it EXACTLY as they prescribe because, for one example, some of the participants started to lose their intestinal lining and have blood in their stools. These macros have been tested under very strict laboratory settings. Dr. Longo also mentions specifically that diets like Keto are terrible long term and actually age the body. IF YOU ARE GOING TO DO THIS, DO IT SAFELY AND GO TO THE SOURCE. Hi Stephanie. No worries. Dr. Longo’s work is amazing, but alas, his program, supplements, and food costs money. Again, everyone should check with their doctor if they feel that something is not right in their diet, or something that they are eating may not suit them. And yes, some people do keto very poorly… They eat junk protein, processed foods and meats, and omit greens and fiber. So, I give you that, but we cannot over-generalize everybody who fasts, and everybody who does keto. There are definitely many sources to eating well out there. Thanks for sharing.